Let’s set the record straight: Carpenter ants (Camponotus spp.) are not all “evil” or “bad.” They play a positive role in forested environments. Carpenter ants nest in both living and dead trees, as well as rotting logs and stumps. 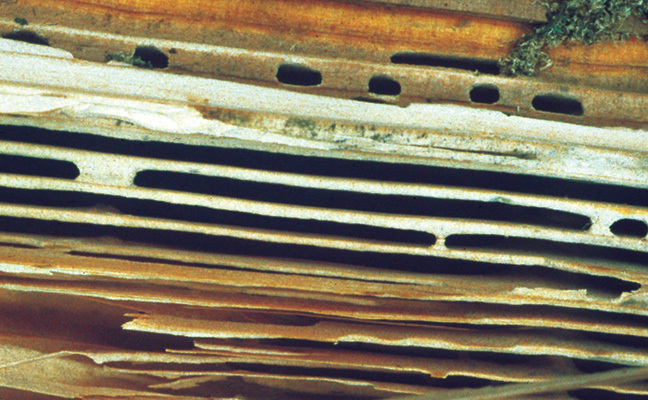 In the northern tier of states and in southern Canada, carpenter ants have a significant role in starting the degradation process in dead trees. By tunneling through wood to excavate nest galleries, the dead wood is opened to fungi, bacteria and other wood-destroying organisms (WDO) to begin decomposition and natural recycling of materials. Carpenter ants use their mandibles to excavate wood and transport the shavings to locations in the nest. They eject the shavings through nest openings called windows. Their galleries and passageways have a smooth, sandpapered appearance, and are constructed continuously to accommodate the growing colony. The galleries are irregular in shape, and usually follow the grain or softer portion of the wood. Some of the older layers of wood are left as walls that separate the galleries. Carpenter ants use their heads to strike this wood when alarmed by disturbances. When nests occur in structures, homeowners and technicians may be able to determine the location by listening for these sounds. In natural areas, parent colonies are usually confined to the base of the trees, with galleries extending into the roots and trunks. Nest entrances may be located underground, with ants entering live trees through cracks, scars, knotholes and decayed areas on the trees. Carpenter ants also are a vital link in the forest food web. They play a key role as predators of forest defoliators and other insects — and in turn, are prey for fish, reptiles and birds such as the pileated woodpecker (Hylatomus pileatus). When homes are built in and near forests or natural areas, carpenter ants may become a threat. In urban environments, landscaping often includes trees that have the potential for a parent nest as the trees age. Colonies of carpenter ants can be a single unit, or the colony may consist of a main nest and several satellite nests that can be found in a number of locations. Some are contained to small areas such as within wall voids, or in larger areas under subfloor insulation, under attic insulation, in support beams, or within stacks of firewood. Most carpenter ants establish their initial nest in decayed wood, but will extend galleries into sound wood. The main, or parent nest usually is located exterior to the structure and can be found in trees, stumps, stacks of lumber, landscaping timbers or within retaining walls of wood timbers. Recycled railroad ties used in landscaping provide ideal nesting sites for parent colonies, as the preservative only penetrates a few millimeters into the wood and the timbers often have cracks or openings to allow for moisture and ant entry. The parent nest requires high humidity for brood development, and conditions outside the structure meet these requirements. Mature brood, pupae of winged reproductives, and workers often are transported during the summer months to warmer, drier conditions in structures, and satellite nests are established that can overwinter. Ants have complete metamorphosis, which means they pass through the stages of egg, larva, pupa and adult. During the active season (March through October), the egg-to-adult sequence takes about 60 days. A carpenter ant colony consists of adult forms and brood. The brood consists of the eggs, larvae and pupae that are completely dependent on workers for food and care throughout their development. The adults include a queen, the egg-producing segment of the colony, workers — who care for the brood, excavate wood for nests, forage for food and care for the queen — and winged forms, both male and female. The winged forms are produced in late summer and overwinter in the nest, either satellite or parent, and emerge the following spring (April to June) to mate and start colonies in new locations. Colonies that are six to 10 years old may produce winged forms. During the first warm days of spring, these reproductives emerge from the nest for their mating flights. After mating, the males die and the inseminated queen selects a nest site, usually in a small cavity in a stump, log, under bark, or in structural timbers with high moisture content. The queen produces her first eggs and nurtures them through development to the first small workers. In successive broods, the workers care for the queen and take over the activities of brood rearing.